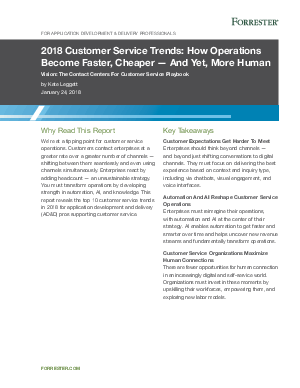 Customer service organizations are struggling to react to the pace of innovation and the explosion of channels and devices. To get ahead of these challenges, AD&D pros must deeply invest in automation — automated answers, automated conversations, automated agent guidance, and automated end-to-end processes. They must also invest in intelligence to ensure automated technologies evolve and learn from prior interactions over time. Automation and intelligence quell the headcount increases. They will free agents from working on low-value or repetitive tasks, as they will only have to address highly complex customer scenarios or exceptions to standard operations. This also enables them to focus on building connections with customers to garner their satisfaction and loyalty.